EARLY BIRDS AT LONG BEACH Standing L to R -- Wilber, Young, Bates, Edgerly, Kimball, Clark, Torrey, Warren, Holtzem, Leon Canady, Claverie, Buel Canady, Spencer, Wheaton, Addems, Marshall, Page, Broadwick, Diehl, Messer, Hutchinson, Nichols, Krull, deHart, and Laird. Kneeling -- Hodgdon, Garber, Sinclair, Willard, Loening, Holderman, Carter and Wysong. We had a delightful time, all 35 of us - the largest number of Birds at a Reunion since 1965 when we had 48 at Dayton. In addition at Long Beach there were about 45 relatives and friends. 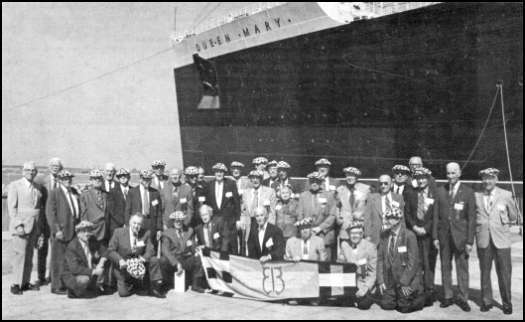 Our headquarters was that luxurious, beautiful and majestic liner, the "Queen Mary." If I go on raving about that magnificent ship, I'll delay getting to the story of our Reunion, so I'll describe the "Queen" in another article.